The Jaguar XJ Coupe 220 is actually a concept car. A concept car is a platform used by the manufacturer to launch a future model and showcase it in car shows. This way they are letting the world know what to expect in terms of technology and what the major changes are going to be. Typically a concept will be based on new and a futuristic technology. When the final model was released it was no doubt a magnificent looking car and with supreme specifications. The word super car is as sensational as the word super man for car enthusiasts and this is one of these cars that people would kill to have. The Jaguar XJ Coupe 220 is a successor of the XK 120 and has proven itself as worthy as its predecessor. The first concept car for the Jaguar XJ Coupe 220 was showcased in the British Motor show in 1988. What was meant to be a racing car came with a V12 engine with 6.12 L capacity. It was capable of a whopping 500 horsepower output. The car sported the classic scissor style doors of the Jaguar. The car is based on the all wheel drive system and can do a top speed of 220 miles per hour. However this prototype car was made much heavier than the other racing cars. The Jaguar XJ Coupe 220 was officially announced for launch in the year 1989 and was priced at $580,000 USD. Obviously it was not released into the market readily and was ordered first and then manufactured. This often happens with high end models and even in this case a prospective buyer had to first put in a deposit of $80,000 USD. When the car later went into production the production version was released to people on October 1991 and by the time the produced version was released the car also underwent some significant changes on the interiors. The drive train for the car was completely different from the concept car version and was made more to suit the needs of the daily usage then a high end racing car. 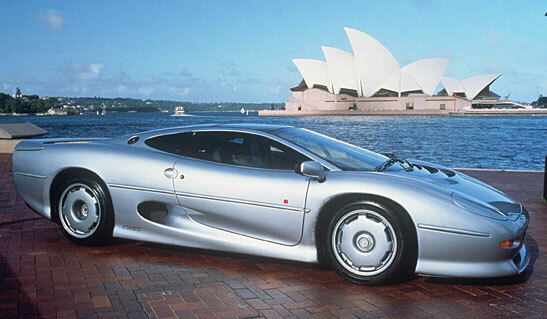 However Jaguar had only planned for a limited release of 220 cars initially and may be to the maximum limit of 350 cars. The engine size and the specifications initially did create some trouble for the Jaguar XJ Coupe 220 Jaguar XJ Coupe 220 due to emission regulations as the car was not prepared for the emission control systems. It has borne with too many changes already and the emission part was the least expected. However the Jaguar XJ Coupe 220 had to deal with other problems like delivery were the customers had to face prices like $650,000 USD at the time of delivery. Apart from that the customers were also dissatisfied with the changes made to the car. The recession also played a large role in the lack of success for the car., may be it came at the wrong time and a high price.